William Schaw (c.1550-1602) was a practising stonemason and, from 1583, master of works to the king, James VI, with responsibility for royal castles and palaces. 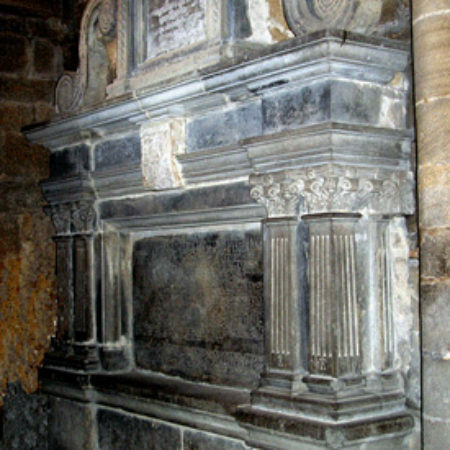 His status is shown by his tomb in the royal abbey of Dunfermline, and, by the fact that it was ordered by James’s queen, Anne of Denmark. Shaw is also regarded as one of the founders of speculative Freemasonry in Scotland. The monument is now sited under the north-west tower and was moved there in 1794 from a position further east in the nave. The tomb is a freestone Classical wall monument consisting of short Composite pilasters flanking a long Latin inscription, in which Schaw is described as a ‘most skillful architect’, with a further inscribed panel on the top supported by heavy scrolled brackets. The monument finishes with a triangular pediment in which is a coat of arms, a star between three covered cups (a variant of azure, three covered cups or, for Schaw (Scotland)), and the initials W. S. William had the right to bear this arms through his family connection with the Schaws of Sauchie, who were keepers of the king’s wine cellar, and lairds with lands near Stirling. It is not recorded that he was awarded the version shown here, and it must be assumed that he added the star as a mark of heraldic difference. 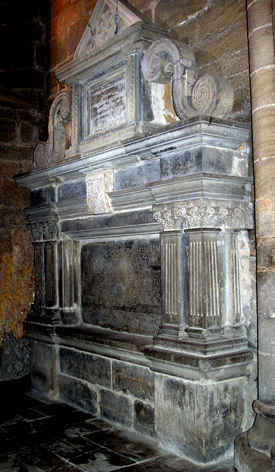 The top inscription, also in Latin, records Schaw’s friendship with Alexander Seton, Earl of Dunfermline, who must have been involved in commissioning the monument. Schaw died in 1602 but the monument probably dates from after 1605 when Seton became the first Earl of Dunfermline. In the centre of the entablature is William Schaw’s name written twice, once spelled out in full, and also displayed on a white marble panel in a device in which all the letters of his name are placed on top of each other. The tomb has two masons’ marks repeatedly and prominently displayed on top of capitals, on the pilaster bases, and on the marble panel, but these are not Schaw’s mark, they are those of the mason who created the tomb, and an assistant. The mason was David Scougal of Crail, named on the signed and dated tomb to James, 7th Earl of Glencairn, and his wife Margaret, in the Glencairn aisle of St Maurs in Kilmaurs, beneath the same mason’s mark; ‘WROGH BE DAVID SCWGAL MASSON BVRGES IN CAREL 1600’. The Glencairn tomb shares the same Classical format, but has figures of the Earl and his Countess in prayer, their elbows resting on books on the ledge of what appears to be a balcony, with their children shown on the front face. Details, such as the capitals, are similar and based on Composite originals although cruder, and include the whorl in the astragal that is also used on the Schaw tomb. Scougal may also have made the tomb to Kennedy of Bargany at Ballantrae which is similar. Medieval tombs, with the notable exception of those made by cathedral works department for monuments erected within the building, are very rarely marked by the masons who made them. Tombs were either costed as single objects, or the different elements of more complex ones were provided by a series of contractors and these removed the need to identify work for a paymaster. Masons’ marks have continued to be used for stone buildings up to the present day, although the marked faces have been invisible in the finished structures since the 18th century in most cases. Signed, as opposed to marked, tombs occur first in the 16th century, and by the early 17th century masons’ signatures had gained popularity, or acceptance by patrons. At first the form was mostly that found at Kilmaurs where an inscription identifies the tomb to the maker and is hardly sophisticated work. Monuments made after c.1600 that are signed reveal a much higher level of education, such as those by Epiphanius Evesham who was signing monuments at this date with ‘EVESHAM ME FECIT’. There is a marked difference between his elegant cursive script and the clumsy efforts of Scougal and certain English tomb-makers, such as John Gildon from Hereford. Scougal’s work shows evidence of a period of transition, with his name and claim of ownership on the Kilmaurs monument used together with his mark, but the mark used on its own for the slightly later tomb at Dunfermline. The use of prominently displayed marks in this way seems to have been a short-lived phase just before signed tombs became common but is paralleled in fireplace construction where masons’ marks continued to be on which masons’ marks can be seen. Richard Fawcett, Scottish Medieval Churches, Architecture and Furnishings, (Stroud, 2002).